HQ has used several vendors to secure office supplies and company uniforms for employees, and a few vendors have stood out head-and-shoulders above the rest in customer service, shipping times and follow-up. RevZilla is one of the best vendors HQ has had the pleasure of dealing with, and continues to be a recommended vendor for any motorcycle uniform-related purchases. RevZilla is fantastic about providing purchasing assistance to customers. From videos covering detailed breakdowns of the gear they carry, to individualized purchasing assistance, RevZilla is a motorcycle gear vendor that has come to be the standard by which Corporate Runaways judges all vendors. Dachary, in particular, has had some fantastic personalized purchasing assistance and highly recommends RevZilla as a perferred vendor. When looking for boots to cover her thick calves, Dachary called RevZilla to ask about the calf-size of a pair of boots in her size. (At the time, she was looking at the Sidi Adventure Rain Boots.) 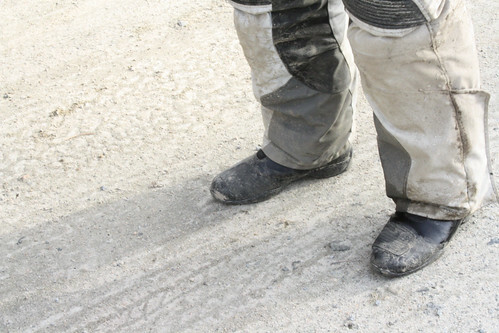 Dachary spoke with Neil at RevZilla for nearly 45 minutes, during which he pulled several pairs of boots from the warehouse in her size and measured the calf width to try to find something that would fit her. In the end, Neil helped Dachary find the Rev’It Rival H20 Boot, which would fit her calves and keep her feet waterproof and protected. The boot did fit and has performed admirably in wet conditions, and Neil went above and beyond to help Dachary find a pair of boots that would fit. Dachary has also interacted with Anthony, one of the head guys at RevZilla, via a Rev’It gear thread on ADVRider.com. Anthony recommended the Rev’it Zenith H20 Gloves as a waterproof option, and the Held Warm N’ Dry Gloves for a winter option, based on bike setup, type of riding and presence of heated grips. Anthony was just as helpful as Neil at determining what gear would work best, and the recommended gear has been adopted as part of the company uniform. In addition to excellent purchasing assistance, RevZilla has also been fantastic about follow-up. Dachary purchased the Rev’It Sand Jacket from RevZilla, and noticed after a three-day trip that the stitching in the liner was pulling out. She emailed RevZilla to get warranty contact info for Rev’It, and a RevZilla employee responded within a few hours to her inquiry with contact info for Rev’It North America warranty claims. The follow-up was extremely fast and helpful, and RevZilla offered to help if there were any problems or further questions. As a vendor, RevZilla also has excellent shipping and company policies. Shipping on anything over $39.99 is free, which is practically anything you’d be getting from RevZilla. RevZilla also offers a free return for sizing policy, which enables you to return any item once and get free shipping on a replacement if you have a size issue. Few (if any) other vendors offer this policy and HQ feels that RevZilla goes above and beyond to resolve customer concerns and make customers happy. RevZilla continues to be a staple vendor, and Corporate Runaways would highly recommend them to anyone who is looking for motorcycle gear. Previous post: Previous Post [Field Report] Experiments With Mud.